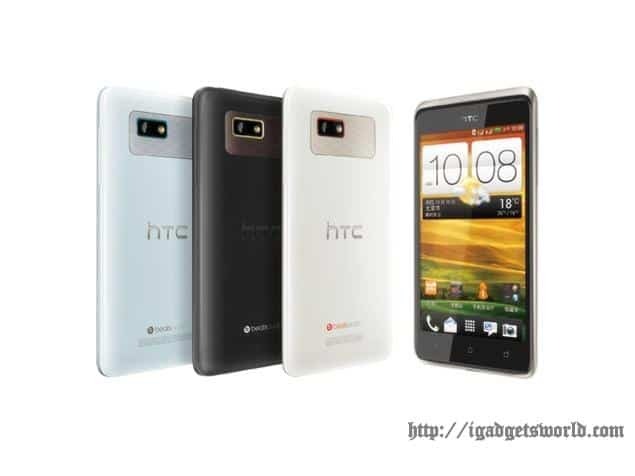 HTC has quietly hinted the launch of its new mid-range smartphone – the dual SIM Desire 400. The smartphone is now listed on the company’s official Russian and Ukrainian websites.The specs listed on both sites are slightly different. So we are not sure which one is the final specifications of the phone. Looks like the specification may differ country by country. The Russian website shows the dual-SIM Desire 400 sporting a 4.3-inch display with 480 x 800 pixels of resolution. It is powered by a 1.2GHz quad-core Snapdragon 400 processor and with a robust 1GB of RAM. That’s very much like the Moto G.
On the other hand, the Ukrainian website lists an underpowered dual-core processor. The other specifications also differ. This one lists a 5-megapixel rear camera and a VGA front-facing camera, which would make it an entry-level smartphone. On the camera front, the site displays an 8-megapixel rear camera with LED flash and a 1.6-megapixel front-facing camera. The 4GB onboard storage can be expanded further via a microSD card slot. Some common features listed by both sites include the usual connectivity options like 3G and Wi-Fi, along with a layer of Sense UI that brings in BlinkFeed. Both sites list a 1,800mAh battery that promises about 12 hours on 3G talk time. So no questions about pricing at this moment! We will keep you updated. Stay tuned.